The (C3) third generation Corvette was introduced in 1968 with styling that originated from a shark, which is why the 1968 front fender vents resemble the gills of a shark. The available engine options are the base (L79) 327 cid small block engine and four 427 cid big block Chevy engines. The power ratings range from 390 hp for the (L36) 427 to 435 hp for the (L71) 427 engine. A special hood was designed for the 427 engine equipped Corvette, with a raised bulge to fit the big block engine under the hood. The L-88 Engine equipped Corvettes have an even higher hood bulge to accommodate the high-rise aluminum intake manifold. The L-88 engine is rated at 430 hp @ 5200 rpm. This rating is considered accurate for 5200 rpm; however, maximum power is estimated to be over 500 hp at 6400 rpm. 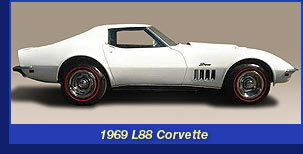 The L88 was originally intended for racing, but is fully street legal, with 80 (L-88) Corvettes being produced in 1968. The 427 cid L-89 engine was rated at 435 horsepower and equipped with three two barrel carburetors and square port aluminum heads for maximum high RPM air flow. A 1968 Corvette equipped with the 427 cid L89 engine could accelerate from m 0-60 mph in 6.5 seconds. The Stingray name is returned to the 1969 model year Corvette and spelled in one word as “Stingray” which is different from the 1963-1967 models that were spelled in two words as “Sting Ray”. The 1969 Corvette has 8 different engine options available that consists of 2 small block and six big block Chevrolet engines. A new standard equipment small block Chevrolet engine is available for the 1969 Corvette with a larger displacement 350 cid V8 that replaces the previous 327 cid small block Chevy engine. The two new 350 cid Corvette engines are rated at 300 horsepower for the standard equipment L75 engine and 350 horsepower for the L46 engine option. In addition to the two small block Chevy engines, the 1969 Corvette has six 427 cid big block Chevrolet engine options available, which includes the very expensive and exotic all aluminum Big Block Chevrolet ZL1 engine. The L88 and ZL1 are factory production racing engines that do not have a specified maximum horsepower rating. The 430 horsepower ratings for the L88 and ZL1 are measured down low at 5200 rpm; whereas maximum horsepower is realistically generated above 6200 rpm, which is 1000 rpm higher than the factory horsepower ratings of 430 hp at 5200 rpm. The L88 and ZL1 engines also have a special high rise intake manifold that requires a taller hood bulge to provide adequate clearance for the carburetor. The L88 high-rise intake manifold is a key component to making more high rpm horsepower by providing increased airflow to the rectangular port big block Chevy cylinder heads. The ZL1 high-rise manifold is an open plenum design and equipped with an 850 CFM Holley double pump race carburetor. The big block Chevrolet L71 & L89 427 engines equipped with 3 x 2 bbl Holley Carburetors have the highest power rating of 435 hp @5800 rpm. The L89 engine is also equipped with aluminum cylinder heads which helps to reduce weight by 70 lbs. The ZL1 is an all aluminum big block Chevrolet engine that weights approxiametly 550 lbs. The light weight ZL1 big block is 135 lbs lighter than the 685 lbs cast iron Big Block Chevy engine with cast iron cylinder heads. The L88 engine is rated at 430 hp at 5200 rpm but maximum power was greater at a higher rpm range, estimated to be 550 hp at 6400 rpm. Installation of exhaust headers also significantly increased horsepower. The L88 engine is reported to make approximately 30 horsepower more than the ZL1 engine which is possible do to better thermal efficiency and piston ring seal of the cast iron block and heads over aluminum. The heavier weight of the L88 engine adds more total vehicle weight to the Corvette and also effects the weight distribution which contributes to tire traction problems during full throttle acceleration. The powerful L88 Corvette with production bias belted red stripe tires had traction problems that limited 0-60 mph performance to 4.8 seconds and drag strip quarter mile elapsed times to 13 second at 112 mph. A total of 116 (L88) Corvettes were produced for 1969 which came complete with emissions equipment for street legal operation. The rarest and most expensive factory built Corvette ever produced is the ZL1 Corvette, which is named after the aluminum engine block RPO ZL1. The ZL1 special engine option with aluminum block and aluminum heads was priced at $4.718.00 which cost as much the 1969 Corvette coupe priced at $4,763.00. The ZL1 engine and required options effectively doubled the price of the Corvette Coupe to over $10,000.00 in 1969. Only two ZL1 Corvettes were reportedly sold to the public with the ZL1 engine option, consisting of one yellow ZL1 and one white ZL1 Corvette. The all aluminum 427 cid ZL1 engine is 25 lbs lighter than the small block Corvette engine; making the 1969 ZL1 Corvette the lightest 3rd generation (1968 to 1982) production Corvette with the best power to weight ratio. The ZL1 engine is equipped with a special open plenum high rise intake manifold and Holley 850 CFM carburetor along with a big .600 inch lift solid lifter camshaft that helps to produce power up to 7000 rpm. The high rpm airflow capability of the ZL1 engine helps to generate approximately 100 more horsepower over the factory power rating of 430hp @ 5200 rpm. There are various reports about the real horsepower ratings for the ZL1 engine ranging from 460 horsepower at 6200 rpm with the restrictive production exhaust system to just over 520 horsepower at 6800 rpm with the installation of long tube exhaust headers. Dynamometer tests of 550 to 585 horsepower have also been reported with good engine tuning. The ZL1 Corvette with restrictive factory exhaust and production tires can accelerate down the quarter mile drag strip in 12.1 seconds at 116 mph. A factory tuned ZL1 Corvette with exhaust headers, slicks and 4.88 gears reportedly performed a 10.9 second elapsed time at 130 mph. Top speed is 180 mph. The ability to go faster than 200 mph is possible with the installation of numerically lower rear end gear ratios. The ZL1 engine is very technologically advanced and the first production Big Block Chevy engine equipped with an aluminum block, aluminum open chamber cylinder heads, an open plenum intake manifold, a Holley 850 double pump carburetor, a dry sump oiling system and a special .600 lift solid lifter camshaft. This was state-of-the-art technology in 1969 and so far advanced that it took 37 years for a comparable production engine to be developed with the introduction of the 2006 Z06 LS7 Corvette engine. 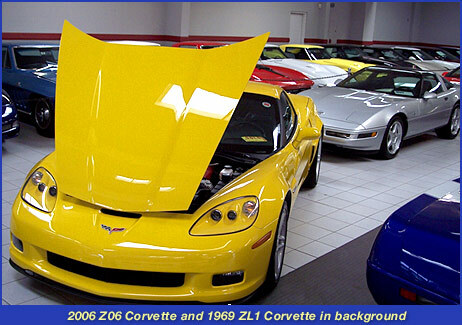 The 2006-2008 LS7 Corvette engine is the only other production Corvette engine with 427 cubic inch displacement, an aluminum block and aluminum heads with a dry sump oiling system and near .600 inch lift camshaft. The big difference between these Super Corvettes is the production volume since there are only 2 street legal production ZL1 Corvettes in existence. 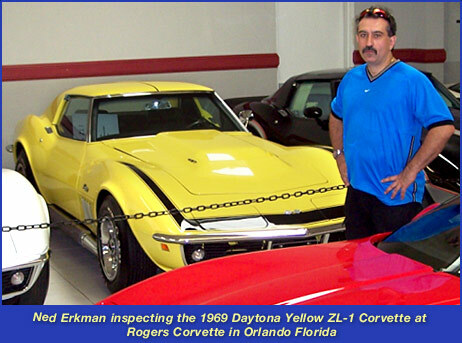 The only place in the world where you can see a Daytona Yellow 1969 ZL1 Corvette with a Millennium Yellow 2006 ZL1 Corvette is at Rogers Corvette. The 1969 model year is the last year of production for the 427 cid Big Block Chevrolet engine; with the L71, L88, L89 and ZL1 427 cid big blocks becoming legendary Corvette engines for delivering incredible power and amazing performance. The 1970 Corvette engine is available with the base 350 cid engine and a new Chevrolet big block engine with 454 cid. Optional high output 350 cid engines are available as LT1 engines rated at 370 hp at 6000 rpm. The most powerful 454-cid engine options are the LS7, which are rated at 460 hp at 5600 rpm. The 1970 Corvette LT1 is equipped with a high performance 350 cid engine rated 370 hp. 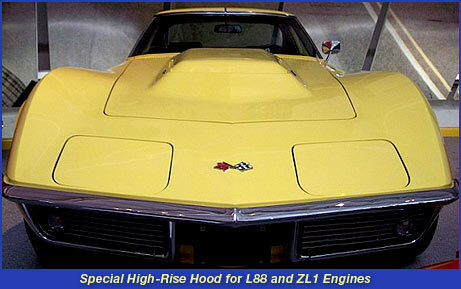 The LT1 engine equipped Corvettes also used the Chevrolet big block raised hood with LT1 decals and stripes. A special high performance option package coded ZR1 was offered with the LT1 engine, M22 close ratio four speed manual transmission, heavy duty brakes, manual steering, special suspension components, an aluminum radiator and transistor ignition. The most powerful 454 cid big block Chevy engine was only offered for the 1971 model year and referred to as the LS6 engine. The other available engines are the base (L48) 350 cid small block engine, the LT1 350 cid high performance small block engine and the 454 cid big block Chevy LS5 engine rated at 365 hp. The LS6 big block 454 cid Turbo-Jet V8 engine option, with aluminum heads and solid lifter high performance cam was rated at 425 horsepower. The total production for the LS6 engine option was 188 Corvettes in 1971. The ZR2 Corvette high performance package was also offered in 1971 and included the LS6 engine option with a close ratio 4 speed manual transmission, heavy duty power brakes, high performance suspension, aluminum radiator and transistor ignition. A total of 12 Corvettes were produced with the ZR2 high performance package. Corvettes produced from 1972-1974 have reduced power due to engine emissions requirements. The 1974 Corvette is the last model equipped with a big block Chevy engine. Corvettes produced from 1975-1980 have two 350-cid engine options. The L48 that is rated at 185 hp at 4000 rpm and the L82 engine rated at 220 hp at 5200 rpm. The last convertible option was offered in the 1975 model year. The 1979 model has the highest production volume record of 53,807 Corvettes, build during one model year. The 1981 Corvette had a single 350 cid engine available as the L81. Power rated at 190 hp at 4200 rpm. The 1982 Corvette was the last of the 3rd generation body style cars. The engine was equipped with a new fuel injection system referred to by Chevrolet as cross fire-injection. The power rating was 200 hp at 4200 rpm. Performance test results can vary for a variety of reasons, including the performance of the motor, efficiency of the car, track conditions, weather and driver skill. The following ranges in test results represent the diversity of performance with a professional driver. Top speed 171-200 mph est. Top speed 162-157 mph est.